Battle City is a Famicom game that Namco made as an improvement over an older arcade title of theirs: Tank Battalion. While Tank Battalion was very blocky with minimal graphics and rough animation, Battle City spruced things up a bit with more graphical variation, an assortment of enemy tanks, power-ups, and smooth sprite movement. Namco did this once before with Warpman, which was an improved version of Warp-Warp. In both Tank Battalion and Battle City (and its eventual sequel Tank Force), the object is simple: protect your home base from the onslaught of enemy tanks. Your base, signified by a falcon, starts out safely behind a fortified wall. But it only takes a few bullets from your enemies (or yourself) to blow a hole in the wall, making your base vulnerable to attack. In fact, all brick walls can be destroyed in this fashion. All you can do to prevent this is destroy every tank as fast as possible. Some tanks provide you with valuable power-ups when they are destroyed, such as faster shots or shields. You can see a tally of how many of the 20 tanks remain on a stage before you advance to the next. There are 35 stages in total. After being released for the Famicom, it was converted into an arcade game called Vs. Battle City using the Nintendo Vs. arcade technology. In 1991, Nova ported the game to the Game Boy, adding 65 more stages to bring the stage count up to 100. However, the reduced screen size resulted in only a portion of the maze being shown so a radar was incorporated into the game. Namco later included the game in their Super Game Boy compatible compilation Namco Gallery Vol. 1. Battle City has made one more appearance since then, in the Japanese version of the Nintendo GameCube title Star Fox: Assault as a hidden bonus game, along with other classic Namco titles Xevious and Star Luster. You are the last member of your army's elite tank commanders, with no choice but to defend your fortress against an entire army of enemy tanks bent on your base's destruction. Break holes through the walls and situate yourself strategically to remove the enemy as quickly as possible, but stay out of their line of fire, and don't let them shoot your base down. You start out at the bottom of the screen next to your base. Enemy tanks will appear from one of three positions at the top of the screen. In each stage, there are 20 tanks in total you must defeat in order to advance to the next stage. You can fire in four directions. Most tanks only require one hit to destroy them. One type of tank requires four hits. If one enemy bullet hits you, you lose one life. If your base is ever hit by a bullet, the game is automatically over. Bullets can destroy walls, whether they are fired by you or the enemy. It takes four shots to break through a standard width wall. Enemy tanks that flash red provide power-ups whenever hit. The power up will appear randomly somewhere on the screen. 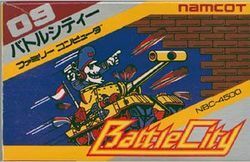 In addition to being released on the Famicom, Battle City was later ported to the Game Boy as a stand-alone title, and later as part of the Namco Gallery Vol. 1 compilation, which was compatible with the Super Game Boy. It was also released for the Japanese only Fujitsu FM-77 home computer. This page was last edited on 2 March 2016, at 02:04. This page has been accessed 31,419 times.